It was an ancient custom among the Romans to set a mark upon their soldiers and servants, that it might be known to what master the servants and to what general the soldiers belonged. The servants usually received this mark in their foreheads and the soldiers in their hands. To this custom Revelation alludes in the sealed faithful, but also those that will receive the mark of the name of the beast in the last days. The prophecy says that the image of the beast is given spirit, that is, it is given life and will cause to be killed as many as would not worship the image. This image, that we discussed in its chapter, is the Bilderberg Group as a representative of the New World Order. To worship or bow down to the image of the beast, the Bilderberg Group, is to obey all its laws, rules and regulations. This can mean only one thing: to obey the ten-horned beast (the New World Order) is to receive the mark of the name of the beast or the number of the name of the beast, 666. It is important to know that the mark of the name of the beast (the New World Order) and the number of its name, 666, are two different things that will be studied in two different chapters. Although they are two different things they have one function, that is, those who do not receive the mark of the name of the beast or its number will not be able to buy or sell anything. Notice also that the prophecy does not say the mark of the name of the beast and the number of the name, but the mark or the number. This means only one thing: receiving either one of them will be sufficient for falling from grace of YHVH, which will lead to the curses in the Book of Revelation. Also, the mark of the name of the beast is not to be confused with its image (the Bilderberg Group) as this will be natural to do so and associate a mark and an image of an object. The mark of the name of the beast may well be a material thing, i.e. computer chips, unlike the image which is a political body (the Bilderberg Group). They are different, because the mark of the name of the beast will be put on or in the human body (i.e. the right hand or forehead) and without which no one will be able to trade. And those who refuse to accept it will be killed. While the Bilderberg Group is the one that causes those who refuse the mark of the beast to be killed. Therefore, the image has the same function to kill as the mark of the beast does, but it is different from it by nature. It is important to know that the prophecy in Revelation does not say that the mark of the beast will be forced on the people, rather it will be received, meaning voluntarily since receiving an object can only be voluntary. Notice also that the mark of the beast belongs to the ten-horned beast, the New World Order, not to the Bilderberg Group, its image. Therefore, the mark of the beast must carry the visible or invisible attributes and signs of its issuer, namely the New World Order. What is the mark of the name of the beast? The most common opinion among the prophecy commentators is that it is a microchip (i.e. RFID, Radiofrequency Identification) implanted under the skin of the right hand and this speculation has its own arguments. 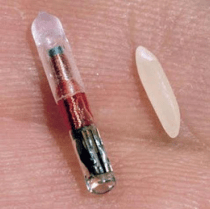 The microchip (RFID, Radiofrequency Identification) aka VeriChip or VeriMed could well be the mark of the name of the beast, because it can store volumes of personal information handily and literally for access at the beast’s desire. After all, it is already implemented and widely used: from pets and cattle to special ops soldiers. 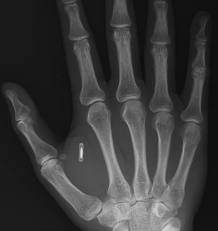 Microchip implants can be used to link medical records, credit history, and social security records among many others. For instance, all medical records are already being digitized as a stipulation of the new healthcare system in the U.S. by the Obama administration aka H.R. 4872. In “Subtitle C—National Medical Device Registry SEC. 2521. NATIONAL MEDICAL DEVICE REGISTRY“, pages 1013 to 1020, a microchip called “a class II device that is implantable, life-supporting, or life-sustaining” is introduced. This “class II device” is further explained in “Guidance for Industry and FDA Staff, Class II Special Controls Guidance Document: Implantable Radiofrequency Transponder System for Patient Identification and Health Information” as RFID (Radiofrequency Identification) chip. The national governments are already holding digital personal data on the people. And if the governments have acquired and hold all personal information, they can require their citizens to carry it in a form of “smart” devices and make work, financial, and health records a part of this data. And if it is so, it will just be a matter of time before the microchip will be implanted in the human body for common use, i.e. trade. As a matter of fact, microchips are already in use. 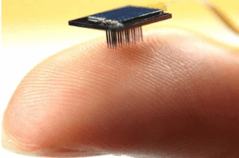 On the other hand, the microchip as it is developed has a little drawback: the 16-digit ID number contained in a chip implant can be relatively easy to obtain and clone by simply using a hand-held device. Since nearly all implantable microchips are unencrypted, they are extremely vulnerable to being read by third-party scanners. By scanning secretly, someone could steal the information on a chip and clone the signal, enabling that person to impersonate a chipped individual. Also, the chip could easily be removed from the person’s body by surgery, as well. Implanting a foreign object is also invasive and may cause rejection by some for a wide range of reasons—from pure ethical reasons to human right considerations of privacy invasion. Actually, many people are on alert, especially people of faith, that the implanted chip is the mark of the name of the beast, and the implementation of it could meet a broad resistance from all social groups of the society. That is why the beast has to come up with a better deception. Or perhaps, this is exactly what the beast would want: rejection of one for the acceptance of the other, in other words, rejection of the microchip for an easy acceptance of the real thing, the real mark of the beast. The latest development towards “the mark of the name of the beast” is taking place in Europe and more particularly in Poland. It is called a biometric ATM allowing customers to withdraw cash simply with the touch of a fingertip. Although it is first used in Europe, biometric cash points have been embraced in other parts of the world for some years. There are now over 80,000 biometric ATMs in Japan, currently used by more than 15 million customers, but are also dotted around parts of Asia, Latin America, the Middle East and even parts of Africa. These machines run on the latest in “finger vein” technology, an authentication system developed by the Japanese tech giant Hitachi. The company says that an infrared light is passed through the finger to detect a unique pattern of micro-veins beneath the skin which is then matched with a pre-registered profile to verify an individual’s identity. “This is a substantially more reliable technique than using fingerprints,” says Peter Jones, Hitachi’s head of security and solutions in Europe. Unlike fingerprints, which leave a trace and can be potentially reproduced, finger veins are impossible to replicate, according to Jones, because they are, notice this, beneath the surface of the skin. Simply put, the “finger vein” technology appears to be the most secured and natural protection of the bearer’s identity ever created. It is not invasive and it does not look to violate any privacy, therefore, it will not have any potential objections. It cannot be duplicated. And this is exactly what the beast may need for its mark. However, this unique pattern of micro-veins cannot be the mark of the name of the beast, because taken by itself the finger vein unique mark is a natural part of the body and cannot be given on the body. But, there is something hidden in this technology. The pre-registered profile appears to be something else. A person may be ordered to digit-scan the micro-veins in a finger of their right hand to register their personal mark, or as they put it: pre-registered profile, which would be based on their “distinguishing profile.” Not accidently, the developers say nothing about the nature of this pre-registered profile. Another contender for the mark of the name of the beast has been proposed by a company called MicroCHIPS of Lexington Massachusetts. It is in the form of a chip implanted under the skin of the buttocks, and notice in the upper arm, also in abdomen, and it is designed for … birth control. The chip lasts up to sixteen years, which is about half of a woman’s reproductive lifespan, delivering a daily dose of levonorgestrel used in several hormonal contraceptives. The chip can be turned on and off, and then back on again at the woman’s need. What is alarming, however, is that the implications of this technology can go beyond contraceptives. However, “the real thing” may still to come. A federal contractor, The Defense Advanced Research Projects Agency (DARPA), is developing brain chips that will implant or remove specific memories from a subject, a prospect some may deem chilling given DARPA’s previous advocacy of authentication microchips. MIT Review’s Brian Bergstein admits that the notion of implanting or removing specific memories “often sounds creepy,” but that it will be useful in treating PTSD (Post Traumatic Stress Disorder), reducing anxiety or combating addiction and depression. That looks like the mark of the name of the beast, the real mark of the beast. Scientists are heralding the beginning of a “golden age” where minds could be manipulated to function better, although LeDoux acknowledges that ethical implications include the possibility that the application of the technology could lead to the creation of “fearless monsters.” Or, we may add “supper soldiers” for the NWO’s army. DARPA’s push for brain chips that could erase or implant memories takes on a somewhat sinister tone given the organization’s prior advocacy of edible “authentication microchips” and electronic tattoos that can read a person’s mind. Former DARPA director and now Google executive Regina Dugan told an audience at the All Things D11 Conference last year that the tech giant was working on a microchip inside a pill that users would swallow daily in order to turn their entire body into a broadcast signal for identification purposes. This is something the beast cannot wait for. The DARPA brain project will rollout over the next five years and cost an estimated $26 million. It is part of Barack Obama’s BRAIN Initiative — Brain Research through Advancing Innovative Neurotechnologies — a larger program billed at $100 million. For more information go to www.whitehouse.gov/share/brain-initiative. In this chapter we examined the real possibility that one day a microchip or something else will be implanted either on the right hand or on the forehead and those who will except it will actually accept the mark of the name of the beast. The answer is very simple. Behind the forehead is the frontal lobe of the human brain responsible for planning, reasoning, and motor functions. It aids in memory and concentration, judgmental skills and impulse control. Any interference in the functions of frontal lobe can lead to serious cognitive complications and/or desired actions. This lobe is often cited as the part of the brain responsible for the ability to decide between good and bad choices, as well as to recognize the consequences of one’s actions. This is where the New World Order (NWO) wants to put its mark, because the frontal lobe is the seat of spirituality, morality, and one’s free will. The front lobe looks like the perfect place for the mark of the name of the beast. However, the forehead is also the place where YHVH will put His mark on those who will endure to the end and have guarded the commands of Elohim and the faith of Yeshua (Rev 14:12). This is why the forces of the dark side of the world want to make everything possible, everything they can do to deceive even the elected one (Mat_24:24) to receive the mark of the name of the beast. Could a microchip or “finger vein” technology become “the mark of the name of the beast” as a requirement to buy and sell? We do not know, not yet. The national governments and the world government will not miss the opportunities to use the national security card to promote the mark of the beast. Smart credit cards and passports with embedded microchips, iris identification, airport screenings, etc. : all in the name of national security have already been in use by the national governments. However, one thing is certain. The New World Order needs first to pre-condition the society and then to introduce the real thing for acceptance: the mark of the name of the beast. There are millions of people who will be glad to accept it; they will demand the mark of the beast for their own security and convenience by giving up personal freedom for security. And this is already in progress. As said above, the beast has to come up with a better deception than just a chip-implant. Or perhaps, this is exactly what the beast wants: rejection of the chip-implant for the easy acceptance of the real thing, the real mark of the beast. The present author is in opinion that is the case with the real of mark of the beast. Let us again recall the warning in the prophecy that is totally neglected by many: the prophecy does not say the mark of the name of the beast and the number of the name, but the mark of the name of the beast or the number of the beast. The real threat could be the number of his name, 666. This issue will be the subject of the next chapter.